Book Of The Month: October 2015. Eddie Keeper and his wife prepared for the fall of society. They outfitted their ranch for survival, built up defenses and stockpiled years worth of supplies. When the collapse arrives as an engineered plague instead of a monetary collapse, their plans of hunkering down and hiding until order is restored are thrown out the window. Instead they work to save people from the fast moving illness and to maintain a small safe zone around their home. But in this new world, survivors will kill for supplies, criminals have free reign and all the others are zombies that hunt the uninfected. Eddie struggles to maintain his sense of right and wrong in this post-apocalyptic landscape where the safest course of action is to kill anyone you meet rather than speak with them. His actions and decisions make his friends, family and even himself question where the real evil resides, at the ranch or outside of it. Amazon Review By Skinner Sweet May 15, 2015. "The Last Blade of Grass takes risks few zombie apocalypse books take. It is a tight read full of strong characters who are forced to commit unspeakable atrocities in a world overrun by zombies. This book takes surprising risks in Act I that raise the stakes and adds a layer of mystery that keeps the reader engaged to the very end. It also offers a new challenge to the main character, Eddie. See, Eddie is a prepper, which in the zombie apocalypse genre means he is a kind of superhero. He has already made the necessary preparations, stockpiled his survival gear, and knows how to survive where others would fall. This means that in the apocalypse, he needs a bigger problem than just zombies. Robert Brown finds entertaining ways to keep the dilemna grounded. 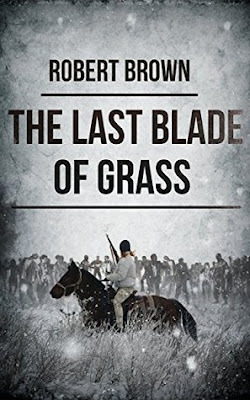 The Last Blade of Grass is a thrilling addition to any book collection. Amazon Review By Thea Sept 27, 2015. "After I have read this book, I saw this as a reflection of our society today. We are facing a battle against the zombies of our society, people that we don’t noticed that are infecting us slowly with the disease that has already been spread. All of us are fighting to survive. And this story is somewhat like the movie of Brad Pit in which he was brought to the place where affected by zombies and looking for cure to stop the zombie and save the world. And I wonder what if zombies really do exist one day? Are we prepared when that day comes? It is really needed that we become aware and should have practice the survival skills as we are all going to do everything for us to survive and we will do anything to save our own. This is a very interesting story and somewhat a eye opener as with the lots of experiments are being conducted in human, it is not far that one day zombies will exist."